In case you hadn’t noticed: Over the past year of financial turmoil, the “safe haven” premium of precious metals has offered about as much support as a rubber ducky in a tsunami. Despite a string of powerful rallies, silver and gold remain well below their March 2008 peaks. It goes without saying that the greatest opportunities in precious metals were not had by those who played the “disaster hedge” card; but rather by those who timed the trends as they developed, regardless of the fundamental backdrop. Bob Prechter is in the latter group. Amidst the buzz and whirl of the most bullish backdrop in precious metals’ recent history, gold and silver prices soared to new, all-time highs and calls for a “New Gold Rush” and “$30 Silver” flooded the mainstream airwaves. 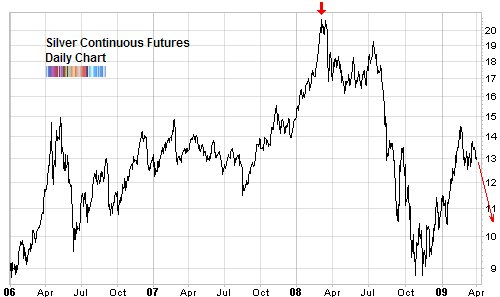 Yet Bob alerted subscribers to an approaching top in the March 14, 2008 Elliott Wave Theorist. Editor’s Note: You can download Bob Prechter’s 5-page report, Gold & Recessions, free from Elliott Wave International. It features 63 years of historical analysis that reveals how gold, T-notes, and the DJIA have performed in recessions and expansions. Since then, it’s been a steady march lower for both metals. Obviously, EWI’s forecasts do not always prove this accurate. Yet in this case the analysis speaks for itself. For more metals analysis from Bob Prechter, download Gold & Recessions a free 5-page report from Elliott Wave International. It features 63 years of historical analysis that reveals how gold, T-notes, and the DJIA have performed in recessions and expansions. I had never heard of the Daily Sentiment Index (DSI). Anyone know anything about it? 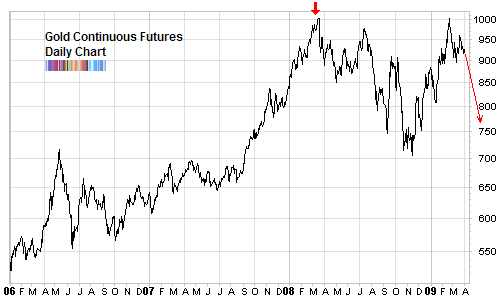 I do know that market timing newsletters tracked by Mark Hulbert that specialize in gold and gold stocks have turned very bullishness since mid February 2009. They upped their exposure from -16.5% (short) to +30.2% (long) within that short time span. While Bob Prechter’s Elliott Wave Theorist is most commonly known for its bearish stance towards equities, their equity focused newsletter: the Elliott Wave Financial Forecaster is up 22.8% for the past 12 months, compared to -43.3% for the dividend reinvested Wilshire 5000 Index (according to the Hulbert Financial Digest). They seem to have the hot hand now. Check’em out. Pej, I usually rely on the K-ratio but in the past while haven’t had success with it. So I thought I’d share another view which has been profitable. Also, the DSI is a new (at least to me) sentiment indicator that I wanted to share and get info on. Have you used it? know anything about how it is calculated? I’d appreciate some info since there’s scarcely anything on it out there on the net. My concern here was that I didn’t see any real analysis at all but more some sort of comments. And I must admit that I like to read about your various indicators and try to see for how close they match my own feelings — in which case I try to understand why I am WRONG. Otherwise, I wouldn’t even bother mentioning it.